You only have to change one life in order to change the world. The question is: Are you ready? 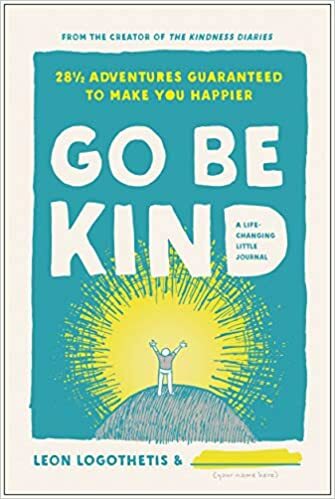 Go Be Kind isn’t just a journal or another how-to guide to creating the life you want. It's a series of daily adventures that will help you rediscover the greatest human gift—kindness, which inspires interpersonal connection and is the most rewarding way to lead a more magnificent life. You will step outside of your comfort zone. You will become best friends with total strangers. Some of the adventures can be done while you’re falling asleep at night. Some of them will open your eyes to things you've never seen before. And all of them are really easy. This adventure is about to change your life. And someone else's, too . . .
Cassandra's Review- I love to be kind even when I have the worst days and even though my life is in no way amazing including some really bad past. I just remember that while there are certainly people in this world who should never receive a kindness in any way, there are so many out there that do. The book has ideas to take your strength and test it. You may have a hard time opening your heart but the book has great moments for you to work on while learning that kindness comes in so many forms.